On June 20, 2017, many Americans shut down their computers. Others turned off their televisions. Still more set down their mobile phones for the night. Few could have imagined the next morning’s news. Fewer still would have predicted a new Arab political reality. It occurred in the heart of the Arab countries, the Middle East, and the Islamic world. Custodian of the Two Holy Mosques King Salman Bin Abdulaziz Al-Saud chairs a recent meeting of Saudi Arabia’s Cabinet. Photo: Saudi Press Agency. 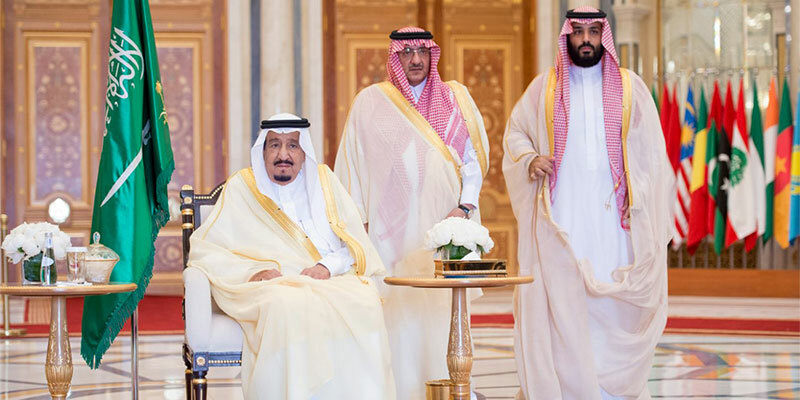 On June 21, Custodian of the Two Holy Mosques King Salman Bin Abdulaziz Al-Saud issued a royal order. He made two epochal pronouncements. One announced that HRH Prince Mohammed Bin Nayef bin Abdulaziz Al-Saud would be stepping down from his extraordinarily rich and productive career as one of the most effective public servants related to domestic security in the country’s history. The king relieved him from his posts of Crown Prince and Minister of Interior. The other stipulated that his much younger cousin, HRH Prince Mohammed Bin Salman bin Abdulaziz Al-Saud, would become Crown Prince. HRH Prince Mohammed Bin Nayef bin Abdulaziz Al-Saud represents Saudi Arabia during a Gulf Cooperation Council meeting on occasion of U.S. President Donald Trump’s May 2017 visit to the Kingdom. Photo: Saudi Press Agency. The order noted that the change was agreed to by 31 of the 34 members of the Allegiance Council. This Council is a body of senior members of Saudi Arabia’s Royal Family. It was established in 2006. The Council’s purpose: to secure the peaceful and successful transition of governance. The king’s pronouncement indicated that there were three dissenting votes. Reports have stated that one was cast by Prince Mohammed Bin Salman himself. One could speculate that the reason was in keeping with cultural norms. Two particular norms are that one not call attention to one’s self and also the norm in one’s personal conduct of always manifesting respect for elders. If so, it would also have religious connotations. One in particular would be acknowledging a powerful hadith. Paraphrased, it stipulates the following: “Almighty God, please show me a thousand ways not to say, ‘I. '” Another could have been wanting the vote tally not to appear as similar to those that periodically transpire in other countries. Speculations aside, Prince Mohammed Bin Salman will retain his other posts. These include his roles not only as Minister of Defense. They also entail that he remain Chairman of the Kingdom’s Economic and Development Affairs Council. HRH Prince Mohammed Bin Nayef with HRH Prince Mohammed Bin Salman at Al-Safa Palace in Mecca after the announcement of the royal order that appointed the latter Crown Prince. Photo: Saudi Press Agency. King Salman simultaneously appointed 34-year old HRH Prince Abdulaziz Bin Saud bin Nayef bin Abdulaziz Al-Saud as the new Minister of Interior. This makes him the youngest person to serve as the country’s interior minister in history. Indicative of the closeness of ruling family rights is that he is the grandson of HRH Prince Nayef bin Abdulaziz Al-Saud. The latter served as Minister of Interior for over 36 years. He was also Crown Prince from 2011-2012. The promotion of Prince Mohammed Bin Salman can be viewed from different perspectives. In one, it could be interpreted as a sign of support for his bold domestic policy and foreign relations projects. If so, this would strengthen and expand his positions and roles as the face of the country’s reform and modernization. It would underscore his commitment to enacting transformative changes to the social and economic landscape of a population where 60 percent of the citizens are under the age of 30. The most notable initiative undertaken by Prince Mohammed Bin Salman thus far is Saudi Arabia’s “Vision 2030.” The Vision is a roadmap to the country’s national development plan for the next 13 years. Vision 2030 is intent on implementing sweeping changes. Among Vision 2030’s core goals is to diversify the Saudi Arabian economy. This goal has been spurred and underpinned by the need to lessen the economic volatility caused by the country’s dependence on the price of oil. The program aims to dramatically alter Saudi Arabia’s employment picture, with special emphasis on women and youth. Overall, the objective is to enhance the quality of life for the Kingdom’s citizens. HRH Prince Mohammed Bin Salman speaks at a press conference unveiling Vision 2030 in April 2016. Photo: Saudi Press Agency. Some of Vision 2030’s initiatives include shifting traditional government-held entities to the Saudi Arabian private sector. A part of this project is a yet-to-be arranged public offering of a roughly five percent stake in the ownership of Saudi Aramco, by far the world’s wealthiest company. Returns from the sale could exceed $100 billion. Such monies would be invested in a new Saudi Arabian sovereign wealth fund. They would foreseeably attract increased foreign investment in companies listed on the Saudi Arabian Stock Exchange. Among other reforms would be the goal of stimulating much-needed changes in the country’s mortgage and finance environments. These are to be coupled with implementation of an affordable housing strategy. The latter would be led by Minister of Housing H.E. Majed bin Abdullah bin Hamad Al Hogail. The heightened levels of revenue from the sale of shares in Saudi Aramco would be used for other purposes as well. A goal would be for them to be utilized to increase the country’s market share of industries such as healthcare, pharmaceuticals, construction, and defense. National Council on U.S.-Arab Relations’ articles and recordings from programs looking at aspects of Vision 2030 can be accessed on the Council’s website. No doubt about it: Vision 2030 is hardly to be understood as a standard outline of what a country seeks to achieve. It is the boldest, most innovative, and farthest-reaching modernization and development plan in Saudi Arabia’s history. Through his role in researching and developing this unprecedented initiative, Prince Mohammed Bin Salman has seen the overarching domes of his domestic and foreign profiles – and his responsibilities – grow exponentially. So, too, have his opportunities to improve the wellbeing of the country’s citizenry. In his new position as Crown Prince, he is now but one step away from becoming his country’s head of state. He is positioned, as never before, to help navigate the shoals of the many uncertainties that lie ahead. Next Next post: The Middle East Today: Where To?